Some of Avery's favorite books when she was learning to read last year. Mo Willem's humorous Elephant and Piggie series has some nice repetitive dialogue and many opportunities for sight word practice, which is an important component for building reading fluency. 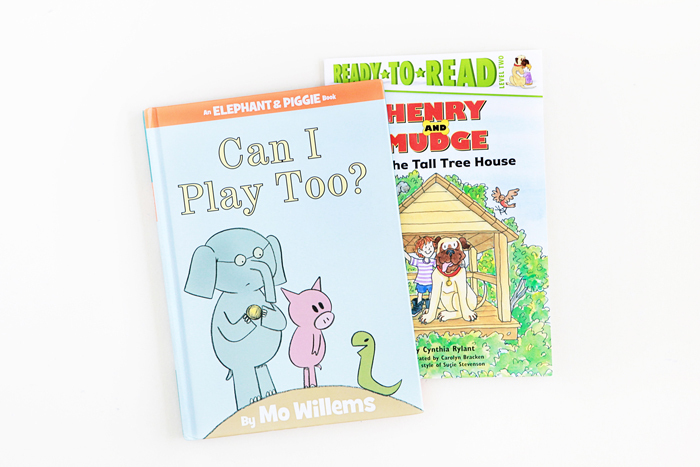 Henry and Mudge is an early chapter book series by Cynthia Rylant that is a perfect transition for your child after they've mastered beginning readers and need a more substantial plot line, with a wealth of new words to decode. The Nate the Great series is also a wonderful early chapter book series for increasing fluency in budding readers. His mysteries provide good fuel for early readers, spurring on their curiosity and honing their inferential, problem-solving and critical thinking skills. There's a good range of easier and more difficult books in the series, plus some repetitive text for building fluency and confidence in reading ability.